I want to think this franchise will do the right thing for once and come to their senses in this regard. It's hard for anyone to tell me that looking at the current lineup of Jaguars uniforms and the rest of the NFL, that the teal isn't the best option. I know Shad said the black would be the new identity of the Jaguars when he bought the team, and I can only imagine he is incredibly stubborn behind the doors in TIAA Bank Field and won't let anyone attempt to change his mind. He's a business man, not an aesthetics person. There's a rumor going around that throwbacks will be worn this year and I can't get behind it. I'd love to see it, but again, I don't trust this franchise to do the right thing right now. This year's State of the Franchise was incredibly lackluster all around and felt like Lamping was grasping at straws. And I always love this event! In other news, the Twitter account posted a video explanation of the 25th logo. Ton of cheap corporate speak, but then this: "Teal is the unique signature color of the Jaguars." Yet another acknowledgement of the best color available and they STILL refuse to use it the correct way and make it the primary. Here we go with Pitt's redesigns. The website is still currently locked on their teaser image - every single url. On first glance, it looks as though they took an archway/pointy-thing from a campus building and ran with it. The number font has an awkward point at the top mimicking this (especially the 2) and the pants stripe has it sublimated a bit too boldly for my liking. Overall, it's a win. Want to see more photos. Auburn baseball has added the tri-colored hat to the rotation this season. The Tigers hadn't worn this design since 2013. I loved it then, but don't feel the same today. Something feels off about it, and I typically love tri-colored hats. This isn't quite as in-line with paid vs unpaid work like much of the other items listed here, but it's just as frustrating. Last night I got word that an Auburn-based Twitter account had posted some work of mine. I take a look, and they had (poorly) slapped a different logo on top of my photo. The base image comes from my site and is the first mockup photo to appear on Google under "auburn basketball court." It's actually an old court, from 2009-10, when Auburn played in the old Coliseum (note the Final Season logos). On top of that, I found a user on an Auburn message board site "blanked out" one of my uniform photos to create a (terrible) template for himself. Even left my logo watermark in the background. I politely asked him not to just color over my photos. I'm very generous with my templates and would be happy to share them with him. He wasn't too respectful with his remarks either. I mentioned I work hard on my product and have built a brand with my site. I check now and see that the thread has been deleted. I've used this thread to discuss softball uniforms in previous years, so don't be afraid to share em here! There are a lot of great new uniforms this season. The beveled diamond-rip off Nike logo is going to be a sore thumb on many designs. 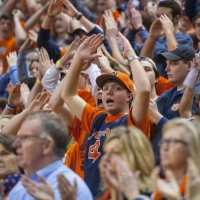 I have always thought Syracuse is one of those teams with so much untapped potential. They are the worst looking orange and blue team around and have been for a long time. 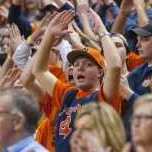 I think this is a great step in the right direction for Cuse. I love the use of the script on the baseball and basketball uniforms and think it could make an interesting alternate football helmet. I really like the overall look for West Virginia. I do think the all yellow football uniform looks a bit too much like LSU. Maybe swap the blue and white stripes? The black alts are my least favorite. I thought the collarbone stripes were odd until I saw the inspiration. I think it might be better if you picked black or grey. The coal dust look could look better on field, but feels odd here.